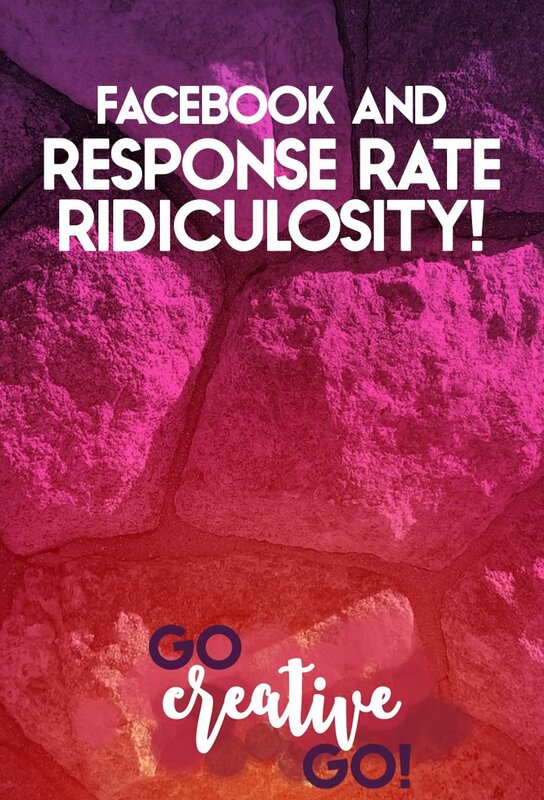 Facebook And Response Rate Ridiculosity - Go Creative Go! Riddle me this (to quote both an old time villain and gal pal Dre Beltrami)? How is it that a 35-minute response rate isn’t good enough for Facebook to provide a page with a badge? Yet, amazingly, it takes Facebook days – if it happens at all – to respond to any query you send to them. Is it just me, or is this epitome of exasperating?!?! Currently, best guess, Facebook’s response rate has to be something like 3,678,245,910,000 minutes. Give or take a million minutes! So, here’s the deal – the prompt for this post. One of the pages I manage has an international following. It’s a very niche group. Enthusiasts who climb trees with pulleys and harnesses. It’s a robust, diverse, and very active, community. But both the owners of the community and the manager of the community (that would be me) reside in Atlanta. Because it’s a small niche community, the page isn’t “manned” 24-7-365. EVERY message sent receives a response. However, we don’t respond within minutes to messages sent during business hours in Bangladesh. We’re sleeping for Pete’s sake (unless the dog gets me up at 3:45 AM, like today) … but, I digress. Our average response time, 35 minutes. This is a small two-man (it’s actually women) operation. I think 35 minutes is pretty ding-danged great response rate. It’s certainly better than many hosting companies (who will remain unnamed) can manage. It’s not reasonable to expect small business owners or solopreneurs to IMMEDIATELY respond to all social media questions, queries and notifications! We can’t be online ALL THE TIME, despite what some experts try to tell you. Facebook: Do As We Say, Not As WE Do! Have you ever received a response from one of the big social media sites within minutes? I know I never have. I’ve many times mentioned Twitter, via hashtag and attaching their handle to my tweets. I’ve literally NEVER received any response. Facebook? You’re kidding right? It can take hours to figure out a means of even contacting an actual human being, then … crickets. Even some of the better bigger social media-driven companies, many of which I think are pretty top-notch, don’t manage immediate replies, despite their seemingly large social media and community monitoring staff. Yet, Facebook has no problem distributing badges based on speedy response, despite their own sloth when it comes to monitoring their own social media mentions and customer queries. I get it. You’ve paid for something, or are interest in paying for something, and you expect a response, rapidly. But is that realistic? Is it fair? Let me ask you a few questions. Do you answer EVERY email mere seconds after it arrives in your inbox? Is your every Twitter mention tackled and ticked “done” in less than an hour, 24-7-365? I’m betting the answer is no. I get it. But let’s be honest. The bulk of businesses just aren’t manned 24-7-365. No matter how “big” they seem to you, they’re still run by people. And people need to eat, sleep, spend time with their families. You can certainly have some expectation of speedy, if not immediate, response when you’re talking about a Macy’s or Comcast (oh my, don’t get me started). But, even then, you don’t know what’s going down in the community command center. What if they’re experiencing a major outage? What if Macy’s headquarters is, at the time of your query, under three feet of snow? Each employee typing out a response to your question, your complaint, is a human being. Maybe they’re not feeling well. Maybe a mom-to-be is working as she fights through morning sickness. Maybe a father of three was up all night dealing with a sick child. Maybe someone’s beloved canine companion of twelve years just passed. Do you get where I’m coming from? When did we all decide that sending a 140-character tweet, even if we don’t rant, meant we’re entitled to a response within minutes, if not seconds. When did the expectation of the immediate response come about? Do you want a quick acknowledgement without any actual answer to your question or resolution to your problem? Or would you like the smart and savvy social media community manager to take the proper amount of time to get you the information you need? I think we need to balance the need for speed with the requirement for a real resolution. And that might mean a short, or perhaps even an intermediate, wait. I am not the least bit worried that my Facebook pages is woefully lacking when it comes to a response rate badge. I’m more interested in sending the right message, not the speedy message. Like This? You Might Like These, Too! Unsolicited Advice: REALLY? Did I Ask For Your Help? Better Blogging: Size DOES Matter! Smart Solopreneurs: Take Care Of YOU First! Find Similar Articles On Pinterest! Share Your Thoughts & Comments! We love a good discussion and appreciate dissenting opinions, too! Ask the majority of customers what they prefer from the two – a speedy response, or a speedy resolution, and more times than not you’ll get the latter as the preferred choice. It’s why customers will wait in line at the Apple Genius Bar, as opposed to going to the local computer store – they know the longer waiting time means a quality service where they’ll get their problem sorted first time, as opposed to a quick buck band-aid that leads to even more issues down the line. While not every company can be an Apple, most consumers will prefer service like an Apple customer. And speed of response has never been Apple’s modus operandi. Maybe that’s something we can all learn from, businesses and consumers. Though the ones that need to learn it the most are the asshat social media purists who push the “be fast or be gone” mantra. You’re lucky I’d finished my coffee, sir! As usual, you nailed it on the head. Resolutions are a required part of a realistic response to any customer or prospect question, whether they’re happy, sad, pissed or any emotion in-between! Team Building: Team Does Have The Letters M and E Expertise: Everything You Need To Know Ain’t Immediate!